Well, ok I know I am behind on this story. And if you are keeping track, I actually am doing the pages out of sequence since I am relying on my thumbnails for the story telling. 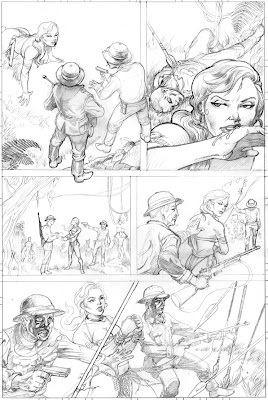 Also I was never happy with this page layout from the first time I did it. So I reworked it a couple of times, now I am fairly happy with it as far as moving the story forward and not messing around too much. So I polished it off today, at least the pencils for it. Now I can move on a bit. Which I am sure you are as happy as I am about it. I want to finish this up as soon as I can. Well let me clear that up. I want to get it done, but I still want it to be one of the best things I have done. So it will take some time. I have to settle for some below grade work on some projects but this one I am not doing that way. I want this to be a piece I can showcase some storytelling and jungle story stuff. Also on the Captain Spectre front. Or rather the scripting of the first issue. I have canned the idea I had for the first issue and reworked it ....yet again. I promise it is a better story this way, and one that will showcase Captain Spectre and his world. I am proud of the way it is going, so I sure hope it is worth the wait. Being excited about it, makes me want to turn out a better product for you guys. So patience Legionnaires, I think it will be worth it all. And have a safe and happy Thanksgiving....from me, chopper, and Captain Spectre. Odd thing, when I started this piece for the auction at the Iowa Comic con that I was planning on attending, I didn't really think about Veteran's Day. 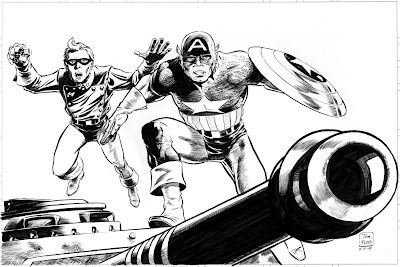 If you know me, as a kid all I ever wanted out of life was to grow up and draw the Captain America strip. Well I know that will never happen. And to be frank with all the changes in the strip and character I don't know if I would want too. Unless they would let me do an old school WW2 adventure. Anyway I am not going to get to make it to the Iowa con. But I did finish inking this piece for them. I will mail it over there when I get the chance. I hope everyone has a great time. I was really wanting to go. Just can't. Deadlines and other factors. Anyway, Good Veteran's day to all the vets, service men and women serving, and the past vets - we are all brothers in arms. I just couldn't resist this. I know it is way early and this is a very long way from being done. But, hey a guy can dream can't he. I needed something to get my blood pumping. And working on this is all that seems to be keeping me going lately. In this process of working on this first issue, I am working really hard on trying to write a good issue/story. I also was the art on this to be top notch, or at least the best I can do at the time. The story is refining itself....that may sound weird to people who are real writers, but I tend to write with alot of visuals. So I tend to wander around in the story. I have learned to chop things that really don't belong. Sometimes I will come up with a scene and think it is really good for along time. Then I wake up one morning and think - what the hell was I thinking, that scene doesn't move the story or help the characters any. So it gets cut. I am still learning, and teaching myself in all aspects of storytelling. So please bare with me on all this. It is a very long process when something like this is creator owned. Or a better term for it is 'it's my baby'. ha. If I screw this up, I screw up everything. I have that feeling. I really want this issue to do alot. So, I just want to see if I can get people interested in the story by making some good teaser pieces for it. I know I am pumped to work on it....now if time will allow me too. 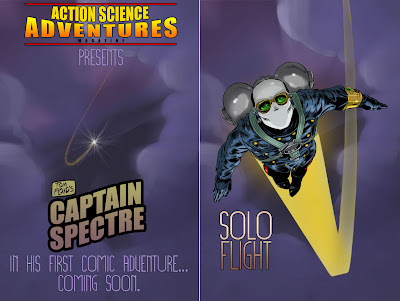 Also I guess I was proud of myself since I finally came up with a title for the story I could live with............ Solo Flight. Well I am deep into working on an educational comic at work. I have worked on a couple of these for this project over the last couple of years. This new one is kind of a sci fi take on a virus story. Actually with tinges of an old EC comics story thrown in for good measure. Of course it is only ten pages long, but since I am doing it all - except the writing, it is going to take awhile. The story was originally written by Martin Powell, but then savaged by political correctness and scientists that have no imagination. So we are lucky it even has a bit of story left tucked in behind the science. I am just posting this too keep you loyal Legionnaires up on what is happening. Of course this is the day job. 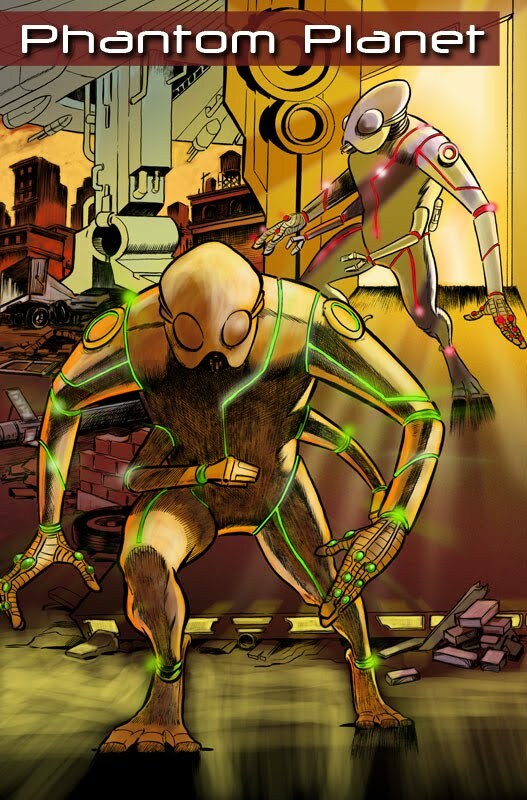 So not to worry things are still progressing on the first issue of Captain Spectre, and working toward pages on the KiGor story too. I know this is taking ages, but I am slow and old - so bare with me in my old age, please. 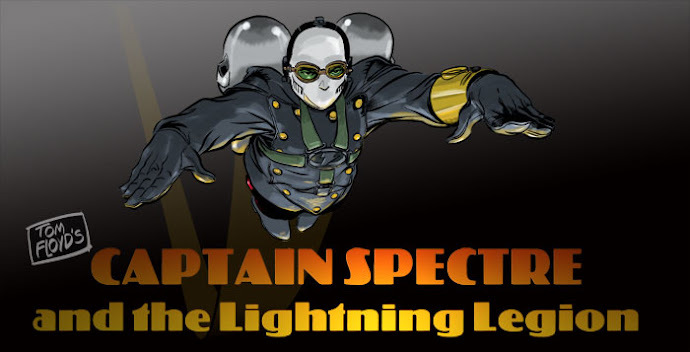 I will post some prelims of things to the Captain Spectre book in a day or two. So stay tuned Legionnaires. Thanks.